Jake Stringer launches a torp during the JLT Series. THE 'torp' is ready to return to football. The AFL has gleaned that the old-fashioned 'torpedo' kick was used as a tactic in pre-season games to combat defensive zones, break down congestion and improve ball flow. 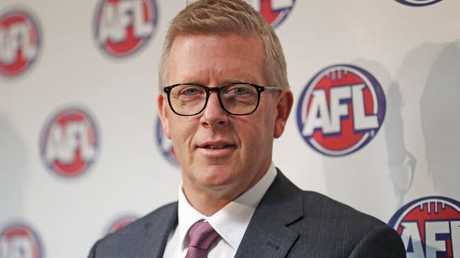 "If you watch some of the JLT (games), there is clearly stuff going on at clubs, where they trying to stretch the ground," AFL head of football Steve Hocking said. "I don't think I've ever seen so many torpedoes in a game during the JLT series. It was back in vogue." Already the deployment of players such as Marcus Bontempelli, Patrick Dangerfield and Nathan Fyfe forward in 2017 was evolutionary in terms of teams getting through zones. 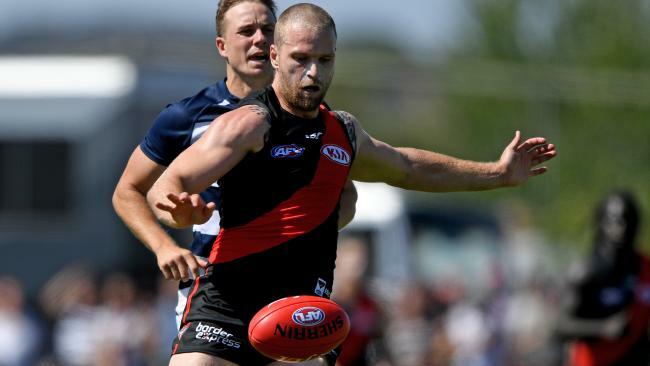 Hocking anticipates more forward time for the gun mids. Zach Tuohy looks to go long. "I think we'll see players like (Dustin) Martin, (Nat) Fyfe, (David) Mundy and (Patrick) Dangerfield playing forward more," he said. Hocking announced the formation of the Competition Committee, tipped to number about 15 current football figures who will assess player movement, competition structure and game analysis for the now and the future. Congestion and the increase in scoring generated from the front-half are among a host of elements on the watch-list for Hocking and his new committee. AFL great Leigh Matthews has identified starting positions or zones as key items on the agenda. "Maybe we could force three players to start within 25m of goal, have another three inside the 50m arc and the wingers would start on the side of the square," he said. Hocking indicated at this stage he'd prefer "pure" football over zones. AFL football operations general manager Steven Hocking. "It becomes the topic of the day, congestion or zones, but my thinking is different to that,'' he said. "I'd like to see a game which is really pure and so how do you manage the game and the decision-making around that so it is as pure as it can be? "And when I talk about pure, I love going to the football and watching the elite players playing to the best of their ability and take the game on. "Some of the stuff we've already worked through during the JLT is about trying to free the players up so they're instinctive in their decision-making, that they have a real love for the game, and they're not becoming robots in the way they play. "For me, it's not necessarily about changing rules and implementing zones, it's trying to understand what the coaches are trying to do, it's trying to understand where they're trying to take the game." One rule which will be strongly policed is the protected zone eight to 10m around the player who has marked or been awarded a free kick, with the aim of further freeing up ball movement. Hocking also announced umpires would be rostered for three consecutive games to improve consistency and familiarity, a first. Hocking shot down a suggestion an AFL reserves competition was on the agenda.